Teeming masses of inebriated and predominantly naked students dancing on tables to classics like summer of 69 and Surfing USA seem to be the norm so far in the student windsurfing race series of 2000/2001. The season started outstandingly in the autumn 2000, with Cardiff University holding their legendary Ram-a-Lamb event and the launch of the newly formed Student Windsurfing Association (SWA). Bangor University followed up excellently with a chilled and well organised Wave event at Rhosneigr for those more expert windsurfers in university clubs. The weekend started on the Saturday morning with gale force winds much to the delight of everyone. Many people arrived late on the Friday night and therefore with not a great deal of boozing time available, were up bright and early with unfamiliarly clear heads. Racing started at a civilised 11.30am, with heats of 4 competitors running until mid-afternoon. The size of the waves increased steadily throughout the day which inevitably resulted in a few kit breakages and people being swept through quite a rinse cycle before being spat out on the beach! The party on the Saturday was of course fancy dress the theme being the letter P. The result was a bizarre mix of amongst others; pirates, prostitutes, pilots, paratroopers and potato-heads. In no time at all, the restrained sober gathering quickly disintegrated with many people being told off by the worried looking management for dancing on the tables. The evening was however slightly interrupted by the DJ announcing that some of the cars parked by Birmingham University were about to be swept away by rising tides and it might be a good idea to move them pretty quickly! Sunday was unbelievably even windier and meant even more entertainment for the spectators sheltering under umbrellas and in cars watching the plethora of tricks being done in an attempt to try and woo the judges. A sprinkling of loops, vulcans and table-tops in amongst long wave-riding runs were what decided the top four winners; Matt Lewellyn from Cardiff University, Tim Watson from Edinburgh University, James BJ Bowen-Jones from Cambridge University and Ian Chucky Ross from Cardiff University. Sponsors for the event included Funsport, West Coast Surf and Snowdon Surf and Mountain. The current spring term of the university calendar has seen the first ever event jointly organised by a university club, Birmingham University and the SWA. The main aim of the newly formed association, is to improve the communication between university windsurfing clubs, and to increase sponsorship and the quality of events. The SWA were keen to prove themselves as top class organisation, and the many appreciative emails from competitors and spectators after the event proved that they did extremely well. The event was well sponsored with a great deal of prizes being donated by Hedonist Surf, Boardwise and Sunsail. As well as donating prizes, Hifly also lent the beginners division three sets of kit to race on which due to a shortage in kit was greatly appreciated. Someone must have done a tribal wind dance before the event, because again, the weekend was full of wind (mostly of the weather kind!). There were around 60 competitors, a brilliant turn out for a new event, and they were divided up into an experts and beginners fleet. Olly Booth from Southampton University and Emily Rae from Cambridge University raced extremely well coming first and second respectively in the experts league, and in the beginners division first and second prizes were awarded to Phil Cutter from Southampton University and Onner Callister from Birmingham University. Not only did the racers have the windsurfing to enjoy, but the organisers hired a bouncy castle (more to keep people warm than anything), and inter-university bouncing competitions were organised both days. All did good choreographed bouncing routines, but the credit had to go with Southampton University, for their interpretation of the New Zealand Maori tribal dance! The social in the evening was organised by Birmingham University, and being students themselves, they knew that the secret blend of a Plastic Fantastic fancy dress theme, free sangria and a chilli dinner would go down a storm. Everyone agreed that a fancy dress theme that is wipe clean when copious amounts of alcohol are to be consumed is a great combination! Throughout the night various drinking contests were held, varying from funnelling to boat races, and Cardiff University received the prestigious honour of being crowned fastest boat race drinkers, an award, that will surely be challenged at every future event. The next eagerly awaited event is the 4th event in the Spring series by Cambridge University, entitled Spring Thor. Their last event saw over a hundred students entering, no doubt mainly for the famous unlimited cocktails on the Saturday night, which really are unlimited, or at least no one has managed to finish them yet, will it happen this year? 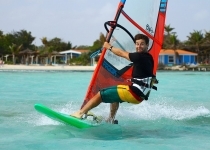 It seems to be a little known fact that the student windsurfing scene is expanding faster than any other segment of the windsurfing market. This rapid growth may be mainly due to the great events organised by the universities, but it is undoubtedly due to the unlimited enthusiasm these young people have for the sport, an enthusiasm that is infectious, and probably the primary reason for all the new members that sign up and start to learn every year. Here are some photos to show you what went all those years ago! 'RamAlamb III' - "Ride hard with a vengeance!" On the 27th and 28th of October, 2001, Cardiff University held their annual inter-university windsurfing event, "RamAlamb". The imaginatively titled race weekend was a great success, with universities from all over the UK participating in a mad weekend both on and off the water. The third and final event of the RamAlamb Series provided much excitement at the start of the student year. Although the conditions could be described as anything but "epic" - everyone had a great time, especially on the Sunday morning "Rodeo" ride. The fetish party also went off with a bang, confirming the concern in the wider community that the student windsurfer had a very sick view of enjoyment! It started with a kiss!! The SWA exploded in to the new-year with the biggest student windsurfing event yet, in fact, it was quite possibly the biggest windsurfing event ever held in the UK, boasting 270 competitors and with over 380 attending the fun and frolics at the party on the Saturday night. The colourful name was a curiosity that got the better of many, only those who attended have the t-shirt to explain its true meaning!! Attendance - 270+ Windsurfers, 382 at the Social!! Well, did we Come in cider...?! Bristol pulled off a great event...see the pics and results here, but for more info on the event, you're just gonna have to go buy next months windsurf mag...! Attendance - 85 Windsurfers, 200 at the Social! !